Developed by Creative Assembly. Published by Sega. Released October 7, 2014. Available on PC (reviewed), PS3, PS4, Xbox 360, Xbox One. Copy provided by publisher. The mark of a truly effective piece of horror lies not in what it does, but in what it doesn't do. A piece of art that can terrify you without even having to show anything, that can make you afraid without a monster, without something leaping out of the shadows, has accomplished something rare and powerful. Alien, the movie that spawned one of the most inspirational science fiction franchises in history, knew this well. For all the moments that we actually see the titular Alien, its those moments where we don't know where it is, where there's no trace of the extraterrestrial killer, that are the most fear inducing. Aliens, of course, went with less subtle action, replacing terror with thrills, and it's an excellent movie belonging to a different genre. It's the movie videogames have plundered for material without shame, and the film most official Aliens games try to evoke. 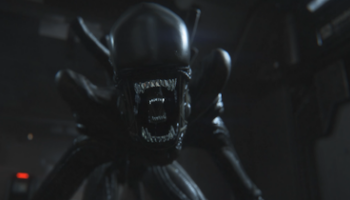 With Alien: Isolation, however, Creative Assembly has gone back to the source, hoping to create a true horror game, a game that makes Xenomorphs scary once more, as opposed to mere cannon fodder. Alien: Isolation is at its scariest when it's not doing anything, and I don't mean that as an insult. This is a game that not only understands its source material, it lives up to it. As Amanda Ripley, daughter of notorious Ellen, players must set foot on the almost derelict space station Sevastapol, a once-hopeful landmark and the creation of Weyland-Yutani wannabe Seegson. It's sometime between the events of Alien and Aliens, and Seegson is in possession of The Nostromo's black box recording, the only clue as what happened to Ellen Ripley. As one might expect, things become more than a simple collection job, as Ripley arrives to find a space station in ruins, with a handful of desperately violent survivors and deranged androids stalking the corridors, as well as something altogether more horrifying. The basic plot of Isolation isn't particularly inventive, with Ripley going from problem A to problem B, more or less spending the entire ordeal trying to escape Sevastapol with her life. What the story does really well, however, is contribute some excellent universe building. Previous games (as well as the movies and comics) have relied on a tiny handful of ideas copied loyally from the original license, rarely daring to create their own unique takes. Seegson, as a small company with big ideas, makes for a more interesting overshadow than the generically evil Weyland-Yutani, and various emails and audio-logs scattered around Sevastapol paint a delightfully macabre picture of the space station's last sane days, as well as shed light on some of the corporation's shady bids for power. Isolation's story starts to tread well-worn ground toward the end (a certain "twist" is a bit too obvious), but it's a decent little tale set in the Alien universe, and one that I truly wouldn't mind being accepted as canon. At first I was a bit leery about a game starring Ellen Ripley's daughter, coincidental and universe-shrinking as it is, but Creative Assembly keeps it credible, and Amanda is a character I feel I'd like to see more of in future. While there is the potential for some combat in Alien: Isolation, this is as close to a true survival horror game that a full-scale "AAA" game's gotten since perhaps ZombiU. Amanda Ripley's greatest weapon is stealth, as anything she could violently fight with is limited, unwieldy, and often uneffective. Ripley may, for example, be able to sneak up on a single human individual and smack him in the head with her crowbar, but nobody travels alone, and standing up to more than one person is going to end in death. Then again, not every survivor on Sevastapol is even hostile, and the game never tells you who the violent ones are. Indeed, the best bet is to stay hidden. Crouching from cover to cover, sliding into air vents, and rewiring Sevastapol's utilities to create distractions are all useful ways of getting about the station unhindered, and there's a simple crafting system that allows for the creation of useful tools, from simple medkits to distracting noisemakers, molotov cocktails, and EMP mines. Ripley can only carry small quantities of each, however, and sometimes using them can do more harm than good. Once again, the player is never informed of what the consequences for their actions might be, and it forces one to think very carefully before doing anything. There are three major threats aboard the station, the first of which are humans. Often armed, and possessed of itchy trigger fingers, they're by far the easiest to take down in a fight, but work together and use firearms to make tackling them head-on a stupid idea. It's impressive how the inclusion of other survivors doesn't turn Isolation into a glorified first-person shooter. Yes, Ripley can find a handful of guns with a small amount of ammo, but once again, combat is so lethal that any avoidance of it is going to be an infinitely better choice. Guns are hard to aim, take a long time to reload, and their noise can attract far worse things. I took a few lives in my playthrough, but doing so only ever feels like a desperation move. The dark horse stars of the show are Isolation's second-tier threat, The Working Joes. These synthetic humanoids are Seegson's answer to Ash or Bishop, but they embody the "cheap ripoff" quality of the corporation, with rubber masks pulled over humanoid frameworks, and dead glowing eyes with no attempt to evoke humanity. Though slow and clumsy, they're horribly resilient (I recommend you try and hit one face-to-face with your crowbar for a fantastic horror movie experience), and just plain creepy. Being chased down by a squad of moving crash test dummies, spouting friendly greetings laced with subtle threats, makes for some beautiful nightmare fuel. Of course, the main attraction is the Alien itself (most often referred to as the "Creature" throughout). Unlike with other games, players only ever face a single Xenomorph during play, and just like in the original film, there's nothing that can take it down. In later levels, when Ripley gets a flamethrower, the very best you can hope for is to temporarily scare it off, but even that's a half-measure. The Creature is unkillable, implacable, and it's looking for you. Once it's introduced, the Alien becomes an ever-present threat for the remainder of the campaign, and in true horror fashion, it's scariest when it's not around. The sound of something crawling in the ceiling is constant, and the realization that your own actions could bring it slithering from a vent in search of murder is truly disarming. If you sprint down a corridor, it might hear you. If you trip an alarm, it may join the party. If you find yourself caught in a fight with survivors or synthetics, the beast may come a-running. Or it might not. And it's this sense of risk, this sheer unpredictability, that turns Isolation into one of the most effective horror games I've ever played.